If you have a stump in your backyard and don’t know what to do, pick up the phone and give us a call. Not only are tree stumps unsightly, but they can also become a big problem! 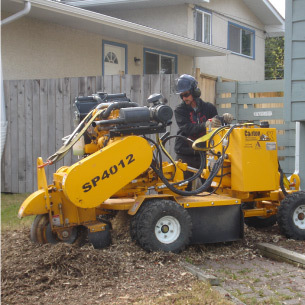 We offer Stump Grinding Service to all of Western Canada with offices in Calgary, Edmonton & Vernon. Stumped? No Problem, We Do Grinding! Stumps pose threats to structural damage. Tree stumps continue to grow after the tree is chopped down. Their roots can grow into water pipes, emerge above ground, and cause problems with fencing and cracking cement. If you plan on doing any construction, you will be required to remove any tree stumps from your yard. How We Can Help with Removing Stumps? It is best to hire professionals to have your stump ground in Calgary, Vernon, Edmonton, Kelowna and surrounding areas. Doing it yourself is dangerous when you don’t have the proper industrial equipment, and attempting to blast or dig a stump out can cause significant damage to your yard. With our equipment, we chip wood pruned from trees into wood chips, and you can receive bark mulch from the stump grinding. We can also reduce large roots that surround the stump. The chipped wood can be used as mulch. If you prefer, we can even apply it directly to the trees and shrubs at your request. Request a free estimate and learn more about our services.